You can see it, right there. It’s the very last section of the law. Okay… what the #$%@$# does that mean? Oy, for the woes of a common law-trained genealogist2 in a civil law world. For Louisiana, bastion of civil code jurisprudence in the United States, talks funny. Using words that just aren’t used, that way or at all, anywhere else. As explained by Claire Mire Bettag CG, “Unlike common law, which is rooted in ancient English law, civil law derives from Roman law. It is usually written as a code and then adopted legislatively as a comprehensive body of law.”3 Which means it uses words that are drawn from Latin, and not the kind of legal Latin you’ll find in common law jurisdictions. Words like peremption. That’s not a misspelling. Really. And prescription. Which doesn’t mean what you might think. These terms are flip sides of a coin in civil law jurisdictions — not just Louisiana, but places like Puerto Rico and Quebec and, oh, most of the world. Peremption is a “period of time fixed by law for the existence of a right. Unlike … prescription, which merely prevents the enforcement of a right by an action, peremption destroys the right itself. 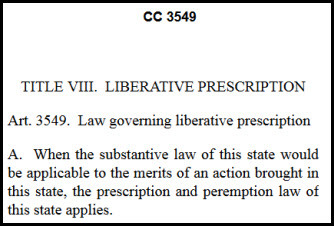 Also, unlike prescription, peremption may not be renounced, interrupted, or suspended.”6 And this concept doesn’t have an exact common law equivalent. So the statute means that whenever Louisiana law applies to a case in Louisiana’s courts (rather than the law of some other state, which could happen if, say, a Texas resident sued in Louisiana because of a car accident caused in Texas by the Louisiana defendant), then Louisiana’s laws about how long you can wait before you sue — and whether you can sue at all at this time — apply too. The language of the law. Which changes if you happen to cross the border into a civil code jurisdiction.